If you are a beginner do-it-yourself mechanic, one who's not afraid to get his or her hands dirty, then this is the manual you need to add to your motorcycle library. 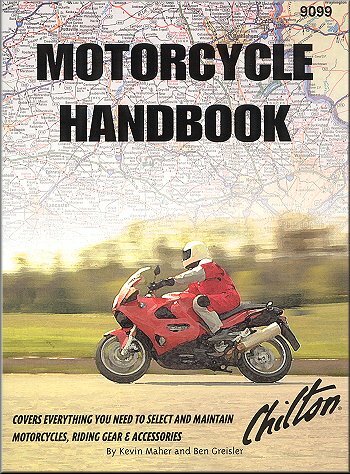 The Chilton Motorcycle Handbook is required reading for motorcycle owners and riders of all levels, and this manual has been a popular one here at The Motor Bookstore, for many years. As all "general" how-to guides, this book is broad in scope, and it should not be used instead of the specific repair manual for your motorcycle. Still, this handbook will provide answers to all those basic, "dumb" questions you don't feel like asking. This is the perfect guide for the beginner motorcycle rider or for the experienced motorcyclist who wants to brush-up on some of the basics. Volumes of material have been written on the best way to go about purchasing a house or car. But much less is available to someone who is shopping for a motorcycle, which is probably one of the next most expensive purchases you might make. If you shop for a car or truck, there are many questions you must ask yourself, such as "How will I use this vehicle" and "How much money do I have to spend?" These are valid questions, when must be asked when you are looking at bikes. There is one additional question which is usually not asked of cars, but which MUST be answered before purchasing a motorcycle; "Will it fit me?" The driver's seat of almost every car or truck on the road today is equipped with a fore aft (forward-backward) adjustment at minimum, though most will tilt and some will even raise and lower of inflate-deflate cushions and supports. On the other hand, only a few motorcycles come with adjustable seats, and if the bike doesn't fit, you will have to live with it or customize it, which is an option most people take in the long run, even if it is just to make a good bike fit even better. The first question you have to decide before buying a motorcycle is simple "what do you intend to use it for?" Motorcycles can be anything from weekend toys, to daily transportation or cross-country exploring machines. The non-riding public often doesn't realize the tremendous variety of motorcycles which are available. Frankly, many don't care, viewing motorcycles and their riders with stereotypes as different as outlaw ruffians or bicycle-like nuisances. We even know of a rider who consulted his fiance for help in picking the color of the first new motorcycle he was ever going to buy. Her startled reply was "I thought all bikes were black?" (It just so happened his previous bike was, and her mental picture of other motorcycles was based only on her limited real-life experience). Some bikes have locks built into them. My bike has a locking fork, a locking seat and a place to store a cable lock. This is nice, but none of the built in locks are very visible. Only by using my cable lock do I give passersby any notion that my bike is protected. The aftermarket has realized that security is as much conspicuity as it is strong locks. One of the more popular motorcycle locks is the disc lock. This style lock fastens through the front brake rotor or on the wheel spokes. The manufacturers have gone ahead and made them in bright colors so they are noticeable to potential thieves. They are also noticeable to the rider who starts to ride off without removing the lock, hopefully preventing a very sudden stop! Other types of locks include cable locks which feed through the frame or fork of the bike and then can be attached to a post or just left entangling the bike. Once again, they tend to be brightly colored as to be highly visible. A new twist to the old fashioned chain and padlock is a specialty chain made up of flat links encased in a protective sleeve. The chain is bigger and stronger than almost anything else out there. The one down side is it weighs as much as a boat anchor! The good part is that no one is likely to defeat it. Some bikes, namely some Harleys, use a fork lock which is nothing more than a tab on the fork that aligns with a tab on the frame. A pair of holes line up to allow a padlock to be placed in them. This locks the fork solidly to the frame. A standard padlock can be used, but the aftermarket has responded with a higher security barrel lock type with a plastic coating to prevent scratched to the finish. Ask a question about Chilton Motorcycle Handbook: A Basic Manual for DIY Mechanics.